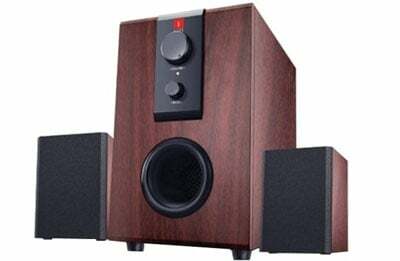 Are you looking for Best 2.1 Speaker for your Computer or for Home Music System which cost under Rs.2000 in India. There are lots of speakers in the market under 2000 but it’s really hard to find which one sounds good. 2.1 Speakers are pretty standard in India. Almost every person who owns a PC definitely has a 2.1 Speakers with their Computer. So which one is to choose from a wide range of Speakers. But It’s actually easier than you may think to find the Best 2.1 Speakers Under 2000 with the help of our clean and simple list. If you want some good quality sound in your home or office. 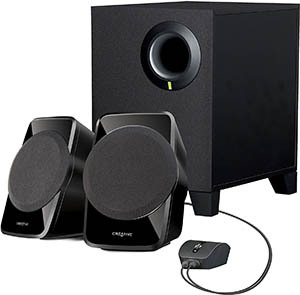 Some high-quality 2.1 speakers that will offer you the volume and clarity you need under this really tight budget. You can also Check our list of Best Soundbar Under 2500 for TV in India. With Zebronics SW2490 you can listen to calming music in rich detail and change the tracks with the remote control while you’re lying in bed. You got lots of connectivity options like FM, USB, AUX, SD Card Support But as expected this one doesn’t have Bluetooth connectivity option. Overall Zebronics make really nice speakers and recently they hire Hrithik Roshan (Krish) as a brand ambassador. So, you can expect good quality sound from zebronics. Conveniently control this speaker system with its remote control while you lie on your couch comfortably. Crispy Vocals with decent bass Output. It has the Output power of 2 X 3Watt Speaker and One Subwoofer. 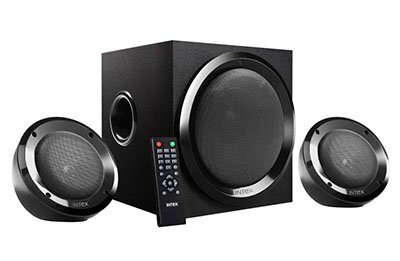 The Intex IT-2202 SUF OS 2.1 Speaker system is sure to provide amazing sound quality at high volumes. 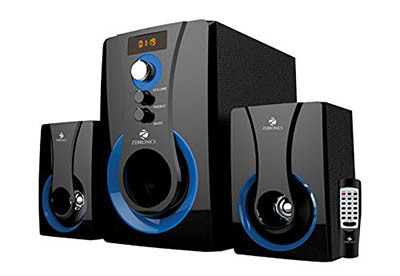 This 2.1 multimedia speaker system offers total convenience with USB support. But if you are looking for Bluetooth you will be disappointed here. But you can use the built-in FM radio for listening to your local radio channels. It Offers great Power Output 44W audio Output. It has lots of connectivity options like FM, USB, AUX & TF, SD Card Support. LED Display on Side for all the information. 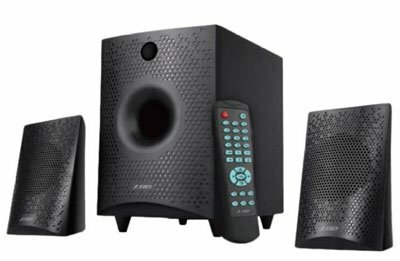 If you are looking for speakers that deliver crystal clear sound quality then F&D A110 2.1 Multimedia Speaker is a great option for you. F&D is a well-known brand in India for speakers they build amazing speakers in the budget range. Control what you want to listen to You can connect your TV, CD/DVD player, PC, Mobile, MP3 player and listen to your favorite music with superior quality. Its connectivity with so many devices makes it a one-stop destination for all the music lovers. 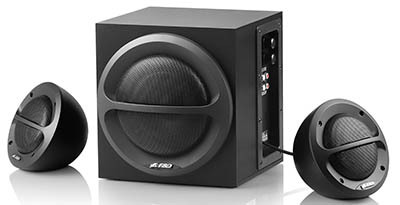 It has 4″ full range driver for satellites speaker, 4″ inch bass driver for the subwoofer. This 2.1 multimedia system supports 65 dB signal-to-noise ratio and has powerful bass controls that allow you to adjust sound settings as per your preferences. Moreover, the controls make it easy to adjust the volume and a total output of 14W RMS ensures that you get distortion-free audio even at high volume. The subwoofer also comes with an inbuilt power on/off feature. The satellite speakers in this set further feature magnetically shielded wooden chassis to offer an amazing sound quality. It’s not the Best but if your budget is under Rs 1500 you can look at these. But here is the pro tip, iball Raaga Speakers sold for only Rs. 1,100 on sale days so if you want to buy these wait for Flipkart or Amazon sale. So, that is Our list if Top 5 Trusted Speakers which we test and use and all are best choices you can make under Rs. 2000. If you have want any help feel free to ask in the comment section below. If you like this article then please share this with your friends and family.